A printer without cartridges? That's right, Epson has developed new printers Ecotank, the first in Spain that do not use cartridges. Want to know more about how they work? You'd tell you all! Check out the video presentation of Epson Ecotank so you know what we're talking about. The new Epson printers are changing the concept of printing, to print at home or in the office leave a luxury. 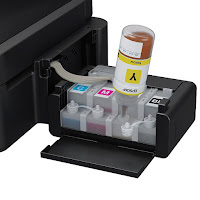 There are two models: Epson L355 Ecotank, printer more or less small size, at a more affordable price, ideal to have it at home; and other more developed, the Epson L555 Ecotank with automatic feed scanner, better print quality and speed, more oriented companies, offices, etc. These printers have a deposit on the side of the 4 main colors (black, cyan, magenta and yellow). These deposits have a capacity of 70ml each color, that the estimate made by the manufacturer allow us to print about 6,500 pages and 4,000 color of the black. In Printers Tips we wanted to make a comparison with some more or less the same range supposed to know how much savings this type of printers.